How Do DIY Heart Rate Monitors Work? Basic HRMs use a chest strap to pick up the electrical signals from the heart. However, due to the inherent design of the chest strap, the accuracy is somewhat limited and is no replacement for the signals recorded by a Holter or Event Monitor. A HRM keeps track of your heart’s R-R interval or the time between R peaks. 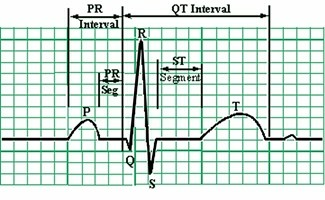 Without getting too technical, the R peak on a generic ECG waveform (see the diagram) corresponds to the ventricle beat (depolarization) and has the largest amplitude (height) of the complete waveform. When the amplitude (picked up as a voltage differential) exceeds a certain threshold, a “beat” is picked up by the chest strap and transmitted wirelessly to the HRM. It is the time between these R peak “beats” that is used by the HRM to determine instantaneous heart rate. It is only going to pick up episodes of arrhythmia as are manifested in ventricle beats (the R on the waveform). Learn more about the EKG signal, see Steve’s article: “Understanding the EKG (ECG) Signal“. So if your arrhythmia manifests itself in funky R activity (higher than normal rate) you will see a corresponding readout on the HRM. In this same light, an irregular or unevenly spaced R peaks will not be picked up by the HRM. This is one of the fundamental differences in how data is recorded by HRMs (R-R interval) versus Holter/Event Monitors (actual waveform). “Polar products are not designed to detect arrhythmia or irregular rhythms and will interpret them as noise or interference. The computer in the wrist unit will make error corrections, so that arrhythmia beats are not included in the averaged beats per minute. The blinking heart symbol in the face of the unit, however, will continue to show all heart beats received. Graphic example PC interface capability of a Polar PC program. Most HRMs provide some internal storage recording capability. While lower cost HRMs simply record low, high and average heart rate, upper end models allow you to download heart rate data to your PC. App-enabled smartphones are changing how this data is viewed, collected and saved for future review. On most of the HRMs, you can set a heart rate zone, and the watch monitor (or app-enabled smartphone) will record how long you stayed in that zone. You could then program a high heart rate zone which you might only enter if you were in A-Fib. 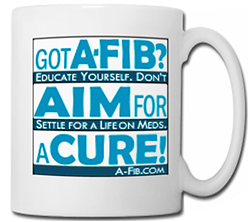 That way you could record how long you stayed in A-Fib and what your max heart rate was. This data could be reviewed on the watch monitor (or app-enabled smartphone) without having to download it to a PC. On HRMs with PC interface capability, you can view data in a graphic form (on some watches/smartphones you can view the graphic data but with lower resolution.) 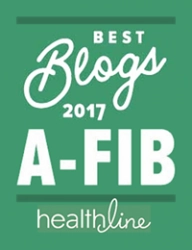 This analyses could tell you when you were at a higher heart rate—A-Fib—and how long you stayed there. Of course these kinds of features require some PC skills, but typically the programs are pretty user friendly. (See the above graphic example of a Polar PC program). 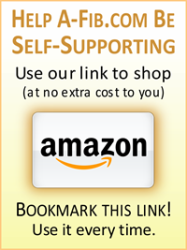 For more, see our article, DIY Heart Rate Monitors & Handheld ECG Monitors. 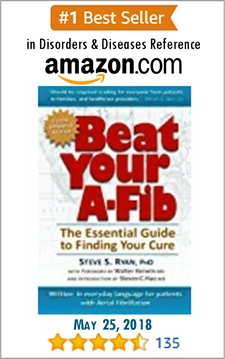 Shop Amazon.com for Steve’s Top Picks: DIY Heart Rate Monitors for A-Fib Patients. 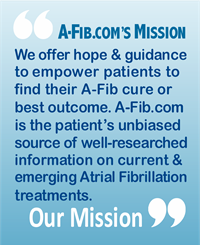 Support A-Fib.com. 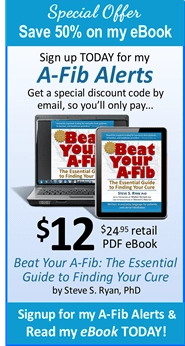 Just use the A-Fib.com portal link to shop Amazon.com and your purchases automatically generate a small commission (at no extra cost to you) which we apply to the publishing costs of A-Fib.com. Bookmark this link. Use it every time.